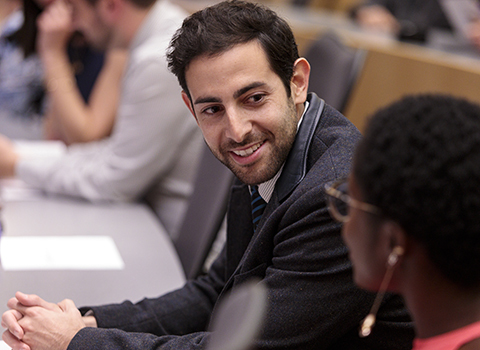 The Health Sciences Integrated PhD Program offers doctoral student training across multiple disciplines within the health sciences, spanning from informatics and program evaluation to implementation science and outcomes research. It builds upon existing master's degree programs in these fields and incorporates new areas of strength in measurement and health behavior. 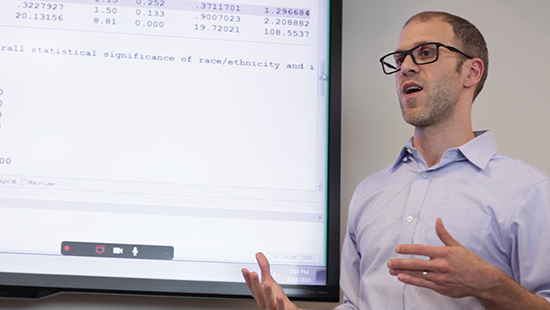 Integration across these programs provides the flexibility for doctoral students to receive rigorous interdisciplinary training in the core content needed for population and health research in the 21st century. 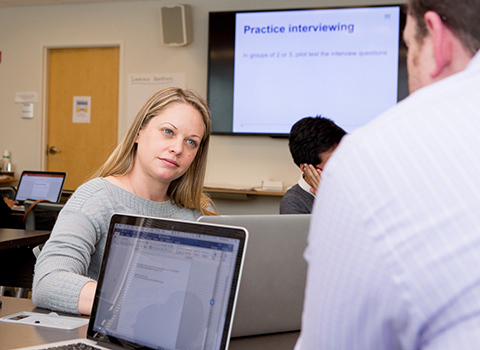 Our faculty members are each assigned to one of our four tracks, allowing them to provide our doctoral students with more specialized training. Choose a track below to browse our faculty’s profiles. You can also visit our About the Program page to learn more about the tracks themselves. 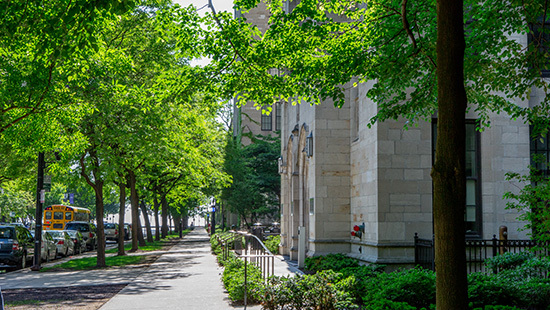 Dr. Barnard completed her undergraduate studies in Psychology at Bryn Mawr College, her MBA at the Kellogg Graduate School of Management at Northwestern University, and a Master's degree in Jewish Studies at Spertus Institute. She serves as Vice President of Quality for the Northwestern Medicine system of seven hospitals and four medical practice groups. Cindy has served on the faculty of the Northwestern MS program in Healthcare Quality and Patient Safety since its inception. She has held leadership roles in the National Association for Healthcare Quality, the Illinois Hospital Association, and the board of Project Patient Care, and has published in healthcare quality, patient safety, ethics and policy. The doctoral program in Healthcare Quality and Patient Safety, within the Health Sciences Integrated Program, enabled Cindy to construct an interdisciplinary, cross-cutting curriculum to advance her research skills and to explore emerging areas in healthcare quality. Her qualifying examinations addressed the potential for patient-reported outcomes to play a role in quality evaluation, and innovative approaches to quality improvement in a federally qualified health center. Dr. Kricke completed her undergraduate studies in Human Development and Psychological Services at Northwestern University, and her MSW at the University of Michigan where she was a McGregor Geriatric Social Work Fellow. 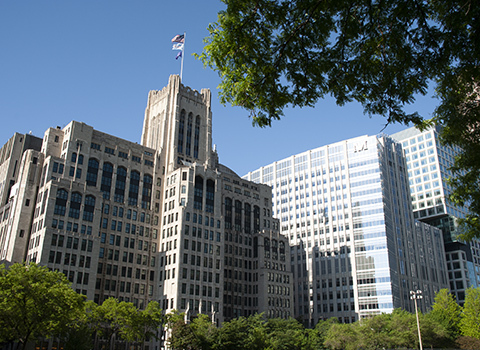 She serves as a Clinical Quality Leader for the Northwestern Medicine system, supporting projects and initiatives that span the system's seven hospitals and four medical practice groups. Prior to entering the Health Sciences Integrated Program, Gayle worked as a social worker in the Department of Health and Aging at Rush University Medical Center, where she led the development of a nationally-recognized evidence-based transitional care model for complex older adults returning home after an inpatient hospital stay. The doctoral program in Health Quality and Patient Safety within the Health Sciences Integrated Program enabled Gayle to develop practical skills for improving healthcare quality and patient while also researching methods for advancing the field. Her qualifying examinations addressed the impact of electronic health records on care coordination for complex older adults, and also developed a framework for integrating health services research, operations, and quality improvement activities within the Veterans' Health Administration. Gayle's dissertation on end-of-life care quality for older adults with multiple chronic conditions was supported by an R36 research grant from the Agency for Healthcare Research and Quality. Dr. Yonek holds a Bachelor of Science in Animal Physiology from the University of California at San Diego and a Master's of Public Health in Epidemiology and Biostatistics from San Diego State University. Prior to starting her doctoral training, Julie worked as a Research Associate for the Center for Healthcare Studies at Northwestern University, where she served as the project director and leader author on a report describing the health status and availability of resources that promote health within Chicago's 77 communities. The doctoral program in Health Services and Outcomes Research within the Health Sciences Integrated Program enabled Julie to advance these research skills and develop content expertise in adolescent mental health services, a topic of great interest to her. For her qualifying examinations, she conducted a systematic review and meta-analysis on the effectiveness of care delivery models focused on integrating mental and physical health services in pediatric primary care settings. She also wrote a mock R01 grant proposal to evaluate the psychometrics of a recently developed measure of integrated care, and to assess the extent of integrated care implementation in pediatric primary care settings. Julie is currently completing an NIMH-funded clinical services research fellowship in the Department of Psychiatry at UCSF. Her research focuses on using mobile health technologies to facilitate integration of mental health services in pediatric primary care, and models to accelerate the implementation of evidence-based prevention and treatment interventions in this setting. After the fellowship she plans to stay in academic research and continue her trajectory to becoming an independent investigator in adolescent mental health services research. Dr. Zheng received his Bachelor of Science in Biostatistics from Southern Medical University in Guangzhou, China. He started his graduate training in the United States in 2011 at Northwestern University, earning his MS in Epidemiology and Biostatistics in 2012 and his PhD in Biomedical Informatics in 2017. Yinan's research centers around identifying epigenomic biomarkers linking environmental exposures and lifestyle behaviors (air pollution, diet, physical activity, etc.) with various aging-related disease developments (cancer, cardiovascular diseases, dementia, etc.) in large population cohorts and clinical trials. During his doctoral training, Yinan had 28 peer-reviewed publications with over 400 citations and he also invented several advanced and widely used biostatistical and bioinformatic tools for longitudinal and high-dimensional epigenomic data analysis. Yinan is continuing this research as a Postdoctoral Fellow at the Center for Population Epigenetics at the Robert H. Lurie Comprehensive Cancer Center within the Northwestern University Feinberg School of Medicine's Department of Preventive Medicine. He also serves as a member of the Student Editorial Board for the Journal of American Medical Informatics Association (JAMIA). And he is a New Investigators Committee member at the Coronary Artery Risk Development in Young Adults Study (CARDIA). If you have questions, please email our program coordinator, Oriana Dentici. To submit an inquiry, you may also complete the form on our About the Program page.